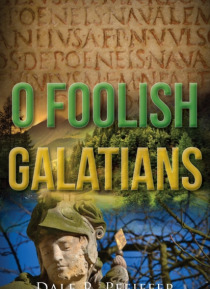 The Pfeifferberg Chronicles: Book Three: O Foolish Galatians trilogy spans a period of time from Julius Caesar, through the Moravian Reformation, and beyond. The story begins with the famous death of the Gaul's sojourning in what would become the Roman Province of Galatia. The Catalonian sons of Captain King Alanus return to their original homeland in what was once known as Asia. Their vision to c… onquer their Greek cousins and restore the pride of ancient Ilion failed. Being a strongly God-fearing people, the Catalonian tribes in Galatia found a kindred spirit among the sons of Eber, the Hebrews. One Galatian king becomes friends with a scholarly Hebrew named Saul from the ancient city of Iopolis. They exchange information and collaborate about their shared heritage. Rumors about a man from Galilee who claims to be God emerges in Israel and captures the curiosity of the Galatian king. After many years, Saul visits the Galatian king in Galatia as he travels throughout Asia. For nearly three hundred years, those that followed the Christ were called, "e;Christians"e; in Iopolis. Another king, a Roman soldier, was providentially commissioned to the Roman Province of Noricum, back to his ancient Bavaria homeland, where he met with great tribulation under the reigning Roman Emperor. After the end of persecution under Constantine, the once persecuted church emerges from various hiding places and unites in conference at Nicene, the land of the ancient Ashkenaz nation. With the powerful State and Church united and with the blessings of the Byzantium Caesar, Christianity spreads through Europa. During the age of feudalism, the Bavarian tribe in the chronicles are given the surname Pfeiffer. After the Reformation, one noble Pfeiffer prince leaves the heartlands of the Habsburg Dynasty and ventures northward up the Rhine River where his builds a secluded farmstead in a small town in the Black Forest. The story ends in the period of the Revolutions of 1848.